A New Yorker writer revisits the seminal book of her youth - Middlemarch - and fashions a singular, involving story of how a passionate attachment to a great work of literature can shape our lives and help us to read our own histories. When I first read Middlemarch in 2014, my intention was to immediately follow up with My Life in Middlemarch. Now here I am, three years later, finally getting to it... and if not for audible's recent BOGO sale, it might have taken even longer . Mead's book is an interesting blend of memoir, biography, and literary criticism. And the writing is excellent, too. Learning a little about George Eliot's life was an unexpected bonus that's left me wanting to read more. It's also probably time to revisit Middlemarch. The audio version is masterfully read by Kate Reading, a veteran narrator with hundreds of credits to her name. I've enjoyed several over years and it was a pleasure to spend my morning beach walks listening to this book. "Only a child believes a grown-up has stopped growing." "A book may not tell us exactly how to live our own lives, but our lives can teach us how to read a book." "Middlemarch permits the reader to imagine other possible directions its characters might take, leading to entirely different futures, and as so often in life, love is the crossroads." My Life in Middlemarch is a wonderful book, despite its arguably narrow appeal. 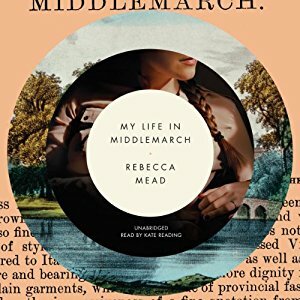 If you've read Middlemarch, you really owe it to yourself to read (or listen to) Mead's book. I've never read Middlemarch so I should probably read it first. Kathy - I think it would be hard to appreciate this book if you haven;t read Middlemarch. It's funny. I'd been convinced I read Middlemarch until the other day when I realized the book I'd actually read was The Mill on the FLoss which I enjoyed. I always meant to read Middlemarch but never got around to it. I'm hoping to do so soonand will keep this in mind as a companion! Katherine - I haven't read Mill on the Floss, but would like to read more of Eliot's books after learning about her life. I still have Middlemarch on the TBR shelves as well. I remember reading an excerpt of this in the New Yorker, and getting distracted by her assertion that George Eliot is a better author then Jane Austen. I hadn't read any Eliot at the time, so I couldn't really argue the point. Lisa - I bristled at that remark, too! Middlemarch is wonderful, but I remember not caring for Silas Marner... and everything Jane wrote is wonderful :) Maybe a Middlemarch readalong after the Pallisers. Looks like we'll begin Phineas Finn next month. You've already read it? Yes, and I love both Phineas & the book! Though the politics confuse me. Lisa - I thought so! Hopefully I can get through the politics, but am already a little worried about it. I love Middlemarch but I've been on the fence about reading this book, though not sure why. Maybe I don't want the author's experiences with the book to trump mine. That you liked it is a good recommendation for me. JaneGS - It seemed like there was more talk about Middlemarch in general and Eliot biography than the author's personal experience. You might like it! I haven't read Middlemarch and don't know if I will, but if I do I'll be sure to read My Life in Middlemarch too. Aren't comparisons odious? George Eliot and Jane Austen, each writing at completely different eras in history. They were both great writers, each in her own way. I loved Middlemarch, but haven't read it since my senior year in college, when I took a course in the English novel. I simply loved it. I had so much to say about it at the time and wrote volumes about it for my course. That course was the very best course I took in English Literature. Judith - Yes, they are... and comparing Eliot to Austen is silly. I've had a lot more experience with Austen, but comparisons like this still make me crazy! Middlemarch is one novel you can really sink your teeth into. It sounds an enjoyable audio, but I guess first I have to conquer Middlemarch. It's a bit intimidating for some reason, density? Susan - If you decide to tackle Middlemarch, I'd recommend a read/listen combination. Juliet Stevenson's narration is excellent!